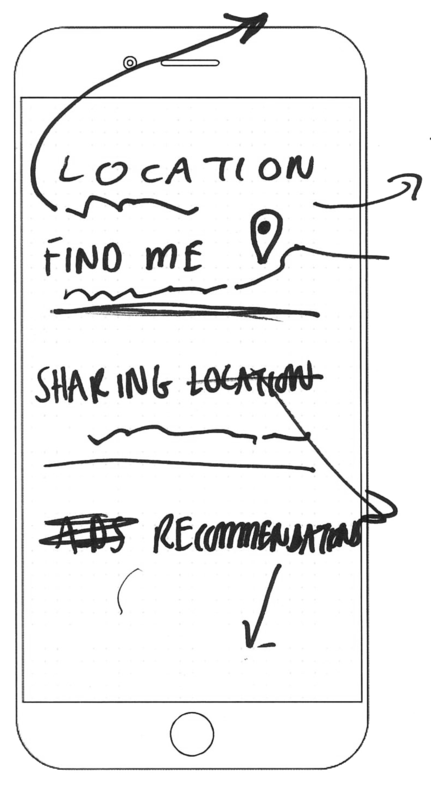 When an app or services relies on personal data to function effectively, it requires us to think deeply about how we design interfaces that enable the exchange of data over time, not always from the beginning. Chariot is a fictional high-end car service app for those who expect a level of comfort and class on the move. 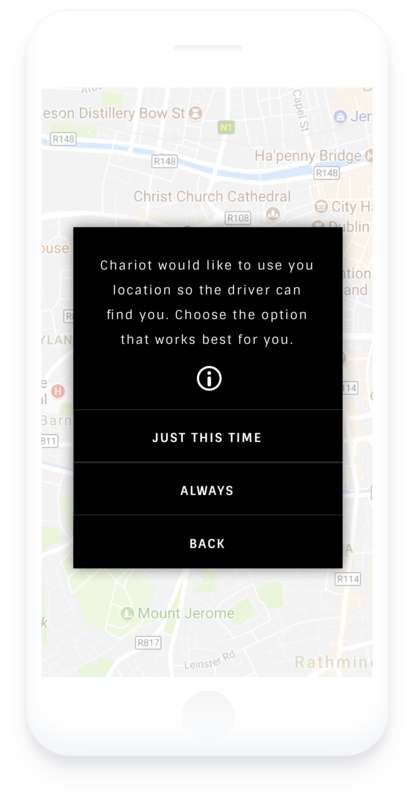 Chariot puts data control into people's hands to 'choose the option that works best' for them. Location based services need to work hard to build trust as there is an innate caution about sharing location publically. The cross-functional Design Jam team challenged themselves to consider ways in which Chariot could be used without the need to collect and permanently store data including location, payment and account details. Over time, if a person is happy with the service and feels in control of their data, they may be willing to make a more permanent data relationship with Chariot by signing up. Chariot allows its service to be used without full sign-up. 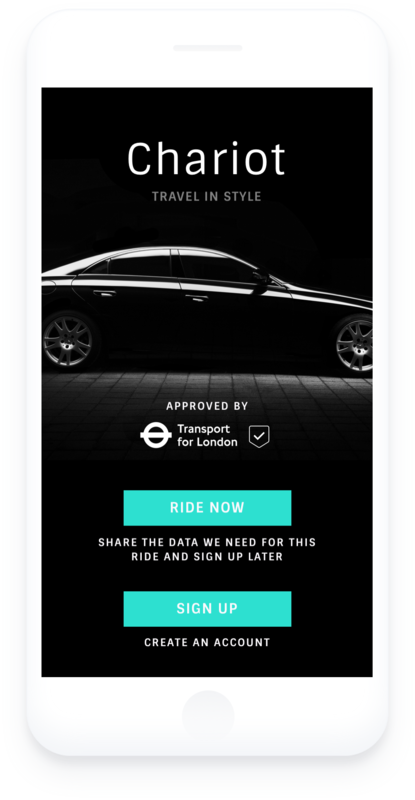 'Ride Now' explains that the person will only be sharing the data needed for this ride with the option to sign up later. This simple tactic allows people to try the service, with minimal personal data stored or processed, and sign up later if they decide to use the service more frequently. Similarly, after the ride ends, Chariot 'asks' if payment details should be stored rather than assuming it will be stored. Each time an action is required, options for data use are made clear through simple and straightforward captions. Apps that rely on location to run their service often compel people to permanently turn on their device location in order to use the app. People can feel that they have an 'all or nothing' deal and are expected to consent to ongoing location access without evidence of trustworthiness or the potential value exchange. The person can select 'Just this time' or 'Always' when they are ready to book a car and their location is required. Selecting 'Just this time' gives people more granular control and does not presume consent to gather location data to be continuous. If the person is happy with the service over time, they may select 'Always' once trust is established. Within Chariot, data can be managed through an easily discoverable settings section, offering an overview of all permissions to run the service: location, journey history, ratings, contacts and payment details. The data is sorted and bundled by type and can be turned on/off through a single toggle action, making it as easy to give consent as to withdraw. In addition, the purpose of any data collection is made transparent through clear and simple language alongside illustrative icons. Make the first time app or service experience as data-light as possible? Give people greater granular options to control data use? Make the transition from trial (no data collected) to sign-up (data collected) transparent, valuable and educational?